My introduction to Campsfield was in early 2008 as a new PhD student and volunteer with the visitor group Asylum Welcome. I remember my trepidation the first time I approached its 20 foot high razor wire topped fence. It was many visits before the surveillance cameras, fingerprint checks, pat-down searches and multiple sets of locked doors became normalised. It took much longer for the meetings with the incredibly varied people being held there to feel anything other than exceptional. Campsfield House opened as an Immigration Removal Centre (IRC) a few miles outside of Oxford in 1993. Previously a youth detention facility, it became the UK’s first immigration detention centre, originally holding up to 200 men and women. It was quickly transformed into a male-only centre and for most of its existence detained a maximum of 216 adults. Like many IRCs, however, the site is being expanded, with an extra 60 beds recently added and proposals to more than double the centre, which would make it one of the biggest in Europe at 610 beds. IRCs look like prisons and they utilise criminal justice techniques and language. Detention is experienced by those inside as punishment and tends to be indistinguishable from prisons to those outside. Those detained are associated with danger in the public imagination simply as a result of being held there. The general public seems not to know – or care – that people do not need to have broken any rules to be detained. The majority of those at Campsfield do not have criminal records, and those who have broken laws have already served their time. Many of the offences are immigration-related, rather than the type that excites the tabloids. Yet media portrays of immigration detainees remain unambiguous in their demonization of detained migrants, with the political action and desperation of detainees frequently written off as ‘incidents’. If we are to fully understand the logic of expanding immigration detention and as well as the broader criminalisation of migrants we have to look at the media and the role they play in legitimating these developments in the public eye. For those who end up in an IRC, the experience is not only one of punishment and incarceration, but also often of multiple levels of uncertainty, stress and insecurity. Although Campsfield is often described by people held there as one of the least bad IRCs (not least because of its small size, which is now under threat), it has suffered controversy from its beginning. 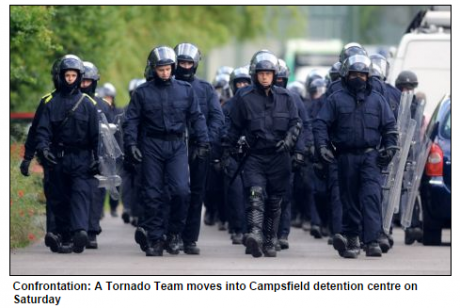 Over half of people detained at Campsfield were on hunger-strike just four months after the centre opened, and the first ‘riot’ occurred three months later. During my research there were several hunger-strikes, fights and allegations of abuse by the authorities. 2007 was a particularly bad year. It began with a ‘riot’ and fires in March, there were over 150 men on hunger-strike by the summer, and in August, there were several separate major incidents, including fires, ‘riots’ and the escape of 26 people. Most recently, in 2013 the centre was seriously damaged by a large fire, which was started by a man with mental health problems. Such ‘incidents’ tend to be portrayed in the media as violent events, in which the pent up frustration of angry men boils over, putting staff and the wider public in danger. For example, and not unusually, the recent tragic death of Rubel Ahmed at Morton Hall IRC was sidelined in media coverage by greater focus on the related disturbance. Such representations risk contributing to public contempt and fear of those detained, and bear little relation to the accounts given by those directly affected. This was vividly impressed upon me just a few months after I started visiting Campsfield. On 15th of June 2008, Campsfield was the site of a fire and what were described as ‘riots’ in the local press, followed four days later by the escape of seven men. Three were not found, one – who I had known quite well – was injured in the escape and immediately recaptured and imprisoned, two were found less than a mile away and another in Oxford the next day. Over the next few weeks I spoke several times to a number of men who had been caught up in the incidents. BBC, March 2007. The first accounts of the ‘riot’ that I obtained, however, were from the local press. These described ‘detainees’ setting fires during outbreaks of violence, through which the Education Block was destroyed, the on-site shop looted, rooms damaged and windows smashed. Dramatic scenes of anarchy were presented, with 15 fire-engines, a police helicopter, 50 specialist ‘Tornado Team’ officers and 50 police officers with riot gear and dogs bravely attempting to regain control. After considerable confusion and fear, eventually Arnold and the others were ushered onto an outside grass area, away from the buildings and flames. Although now safe, they were kept there, with little information or refreshment, for over four hours before being allowed back in to the centre. When Arnold recounted these events to me a couple of days afterwards, he was no longer at Campsfield House, but Colnbrook, an IRC near Heathrow airport. As he explained, because the instigator of the event was Jamaican, all Caribbean men at Campsfield, including Arnold, were immediately transferred to other IRCs. The media tends to contribute to a sense in which IRCs are de facto prisons, with dangerous and barely controlled inmates. The few times that detention centres make the papers, there are images of heavily armed riot police tackling chaotic situations. Alongside this, others downplay events and the deleterious effects of detention, focusing on the fact that the men spent several hours outside in the summer sunshine. Although rather different from the media images of anarchy, this surreal image of men enjoying the fresh air also serves to Other the men, undermining the seriousness and danger of the situation that might otherwise elicit public empathy. In contrast, Arnold’s own account focused on his fear and restricted control over the situation, and of the insult of being treated not as a victim of a traumatic event, but punished as a potential instigator, on the basis of nothing other than his nationality. Acting almost as a metaphor for the whole of the detention system, this event, along with many others, illustrated the contrast between outside representation and first-hand experience. Those in detention tend to be portrayed as criminal, responsible for their own situation and as a threat to the public interest. Speaking to those affected, however, instead highlights people’s fear, uncertainty and powerlessness to alter their circumstance, often stuck in detention even if they actively wish to leave the UK. Alongside political calls for the reduction or ending of immigration detention, we must demand more accurate and balanced reporting by our media. There are some signs of progress, as is seen in the debates around use of the word ‘illegal’. However, there will be little real change unless those with first-hand experience of detention can actively participate. Although rarely mainstream, examples where such voices are given prominence are extremely powerful, as evidenced by a Standoff documentary about Campsfield and Unlocking Detention articles and blog posts. Without hearing from people in this way, there is little chance that the public will think beyond a dehumanised ‘detainee’ when they think of immigration detention, and therefore little hope for political appetite to alter the status quo.